The Chevy Silverado 1500 is just as at home on the work site as it is on the open road. 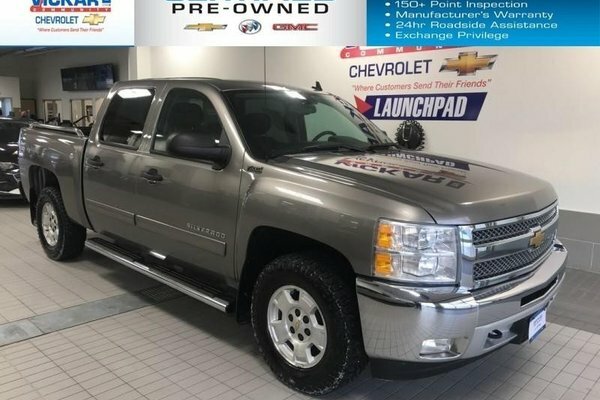 This 2012 Chevrolet Silverado 1500 is for sale today in Winnipeg. Thanks to new technology and structural upgrades plus a strong desire to keep the Silverado a leader in its class, the 2012 Chevrolet Silverado is built with you in mind. The Silverado 1500 offers impressive towing capacities and when you factor in its comfortable seats, a smooth ride, plus low wind and road noise levels, Silverado 1500 proves that it's the truck one you want. This Crew Cab 4X4 pickup has 90631 kms. It's gray in colour. It has an automatic transmission and is powered by a 5.3L V8 16V MPFI OHV Flexible Fuel engine. Buy this vehicle now for the lowest bi-weekly payment of $211.26 with $0 down for 60 months @ 6.99% APR O.A.C. ( Plus applicable taxes - ). See dealer for details.